Vegetables are great on their own, but you know what makes them even better? Stuffing them full of cheese, grains, nuts, beans and, of course, plenty of other vegetables. Stuffed, baked vegetables are a comforting cold-weather staple, and they’re easy to throw together with whatever you have around the kitchen. 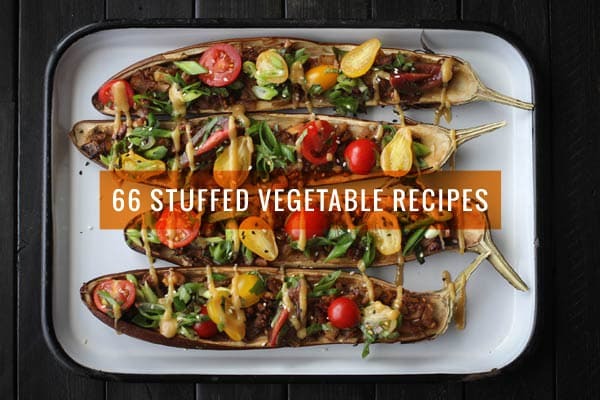 We’ve rounded up 66 stuffed-veggie recipes that showcase all that simple, savory goodness. OMG… best overview ever! I really wanna stuff allll the veggies now :). Thank you for this! I’m turned off by the fact I see a picture of one I’d like to try and can’t hook it up to a name. That main photo looks to die for. But what’s it called? scroll all the way to the bottom and you will see the stuffed eggplant.